SANTA MONICA, CA, 2018-Feb-01 — /Travel PR News/ — Santa Monica Travel & Tourism (SMTT) is proud to announce the launch of a new online store, Shop Santa Monica. Visitors and locals alike can now purchase official gifts and souvenirs from L.A.’s beachside city at the touch of their fingertips by visiting: santamonica.com/store. “We are delighted to have launched Shop Santa Monica in celebration of our charming oceanfront city,” said Misti Kerns, President/CEO of SMTT. “Inspired by a destination that is truly like no other, our collection allows people from around the world to enjoy a piece of Santa Monica. Shop Santa Monica serves as a digital extension of SMTT’s Visitor Information Centers. With over 20 items currently available for sale there is something for everyone. Shipping options include domestic and international. Stay tuned as the selection of choices continues to grow. Customers can display their Santa Monica pride and showcase laidback, beach-style with Shop Santa Monica’s fashionable t-shirts, long-sleeves, sweatshirts, totes and athletic hats. For visitors looking to bring Santa Monica’s coastal vibe into their home, Shop Santa Monica offers a selection of destination-inspired home goods including Santa Monica coasters, Route 66 coffee mugs and a book on the most Instagrammed Los Angeles location of 2017, the Santa Monica Pier – that makes for a perfect coffee table read. 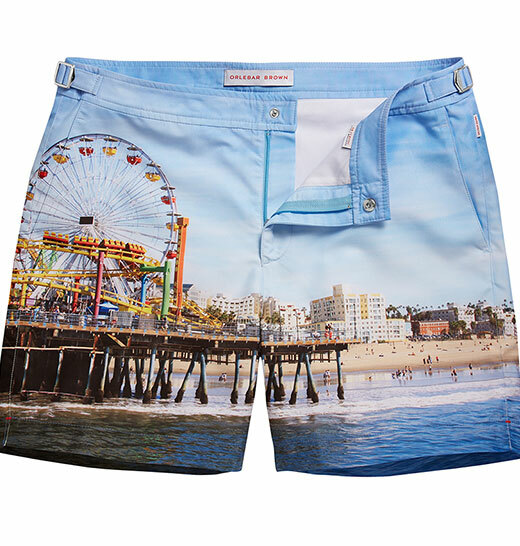 Hit the beach in style with limited edition Orlebar Brown board shorts, featuring the Santa Monica Pier. See what’s in store for yourself when you stop by one of the four Santa Monica Visitor Information Centers found throughout the city. Serving as your source for all things Santa Monica, each visitor center provides friendly, knowledgeable staff, free visitor guides and maps, foreign language lines as well as information on attractions, hotels, shopping, dining, museums, galleries, services and entertainment. Find out more on santamonica.com. Santa Monica Travel & Tourism (SMTT) is a non-profit organization designed to increase visitor expenditures, tourism revenues and local employment opportunities through the promotion of Santa Monica as a travel destination. For travel and accommodation information or a free copy of the official Visitors Guide, the public can write to the Santa Monica Visitor Center, 2427 Main Street, Santa Monica, CA 90405; call (800) 544-5319 or (310) 393-7593; visit www.santamonica.com; or email info@santamonica.com. Follow SMTT on Twitter @GoSantaMonica, on Instagram @SeeSantaMonica or become a Facebook fan at www.facebook.com/visitsantamonica. This entry was posted in Business, Tourism, Travel, Travel Marketing, Travel Shopping, Travelers and tagged Misti Kerns, online store, Santa Monica Travel & Tourism, Shop Santa Monica. Bookmark the permalink.